Hiring a Highland Park Fish Camp bass guide gives you a better chance to walk away with a catch. 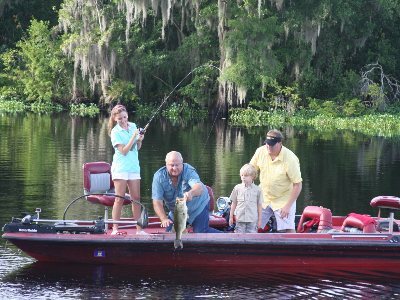 Our bass guides know their way around Lake Woodruff, Dexter, Beresford and the Central St. Johns River. Our guides have over a hundred years of experience combined. We have seven experienced, U.S. Coast Guard licensed bass guides that fish 12 months a year. They all run fully equipped and comfortable boats. Our fishing guides furnish boats, fuel, tackle and equipment. We provide artificial lures and have live bait available for an extra cost. Guide trip costs includes 1 or 2 people with an additional fee for extra persons. Pontoon boats are available for larger groups and the disabled. Live bait (Wild Shiners) are extra. Wild shiners currently cost $19.00 per dozen. Guides normally carry 4-5 dozen shiners for half day trips and 6-7 dozen shiners for full day trips. Our fishing guides are popular, so please be sure to call ahead for reservations. Highland Park Fish Camp is open every day of the year.Looking for a Crappie or Pan Fish guide? See our Pan Fish page. Save time and buy your fishing license a head of time.